COLOMBO, Jan 25 2017 (IPS) - The warnings are stark, the instructions, for a change, clear. Sri Lanka is heading into one of its worst droughts in recent history, and according some estimates the worst in 30 years. The reservoirs are running on empty, at 30 percent or less capacity. Only 12 percent of the island’s power generation is currently from hydropower and 85 percent comes from thermal, with a staggering 41 percent from coal. The rains have stayed away like never before. According to a recent survey by the World Food Programme (WFP) and the government, last year’s rains were 23 percent less than the 30-year average. One of the long-term consequences that is rarely highlighted is the impact droughts have on land degradation. Now the instructions: Use water sparingly, do not wash vehicles with pipe-borne water, do not put air conditioning below 26 C, and light bonfires in the morning if you want to protect your crops from the morning mist, a forerunner, according to local yore, of a impending drought. “It is a very serious situation, something that we have not faced in a long time, but we are taking precautions,” said Lalith Chandarapala, the head of the Meteorological Department. It was his department that first warned of the drought when the rains failed yet again last year around September. In fact, in 2016, there were only three days of exceptionally high rains, during mid-May, when 300 mm fell on some parts of the island. On either side of them, it was drier than usual. The effects have been catastrophic. Of a possible 800,000 acres, only a little above 300,000 was planted with the staple rice crops during the last harvesting season due to lack of water. “This is the lowest cultivation level experienced in Sri Lanka during the last thirty years,” the WFP-government joint survey said. It estimated that by end of December, already close to a million people were affected by the drought in 23 of the 25 districts. By the third week of January, the government’s Disaster Management Center said that over 900,000 were receiving water brought in from outside. “Even if the country receives average rains in the months of January and February 2017, it is highly unlikely that the current drought situation will improve until March 2017,” the joint assessment warned. The government has already slashed taxes on rice imports to fend off price hikes as well as shortages and decided to buy power on short-term agreements from private suppliers till the next rains. The additional power purchases are expected to cost the government Rs 50b. It has also restricted water supply to areas where there is an acute shortage of safe water and ordered a survey of private wells. Millions of Sri Lankan households use dug wells for domestic consumption without any purview by any authority. Any move to curtail such use or to use these wells for public supplies will be a deeply unpopular move. Apart from the short-term impacts of such frequent extreme weather events, experts also worry about the long term implications. “Changing climate is an issue we have to deal with, our policies now have to reflect awareness as well as adaptation measures,” Disaster Management Minister Anura Priyadarshna Yapa said. One of these long-term consequences that is rarely highlighted is the impact droughts have on land degradation. The United Nations’ Convention to Combat Desertification (UNCCD) estimates that 45 percent of the country’s rural population was living in degrading agricultural areas at the turn of the millennium, and that within a decade that population grew by a further 20 percent. A little known fact is that land degradation has serious impact on Sri Lanka’s economy. “Land degradation may be costing Sri Lanka up to about 300 million United States dollars every year. That is approximately one percent of the country’s gross domestic product,” UNCCD said in a statement to IPS. In rural Sri Lanka, the impact of generations of land use without proper care is clear. 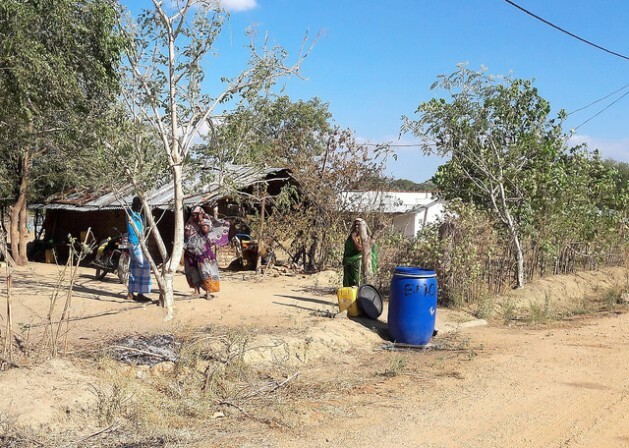 In the southern Hambantota District, farmers who depend on water supply for cultivation have been moving deeper into forests and reserves as water availability becomes less and less reliable in more populated areas. In the Andaraweva area in Hambantota, about 20 km from the closest town a large banana plantation has come up within what is essentially a forest reserve. The plantation which could be as large 20 acres, gains water from a tank meant to be for wildlife nearby. The cultivators who have obtained written permission from local government officials to use the tank water, much to chagrin of wildlife officials, use five industrial level pumps powered by small tractor motors to pump the water and send it about a1km into the plantation. The small lake is being dried out by the over use of water, forcing wildlife officials to despair over water for animals. 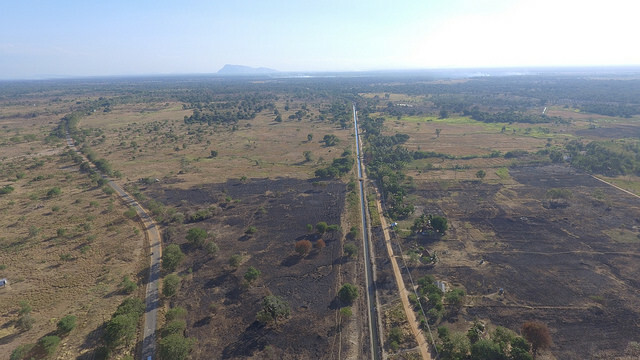 “We have been abusing our water resources for so long, at least now we should be more careful with it, or we would have to be really, really sorry,” head of the Hambantota Wildlife office Ajith Gunathunga said.